Netizen Abe Purungganan reiterated the post from the Jose Alejandrino which slaps the Liberals (Liberal Party members) with the reality of the nation, hypocrisy and idiotic fight for their so called “democracy”. Case 1: If it was President Rodrigo Roa Duterte who needed the revolutionary powers in order to bring order to the chaos of terrorism, the Liberal Party will bark away, calling it a “dictatorship” and vilifying it with comparison to the oh-so demonized former President Ferdinand Marcos. Yet they didn’t even bat an eye when their own, the former President Corazon Cojuanco Aquino took possession of revolutionary powers which in reality brought more harm than good possibly due to her gullibility. Case 2: If it was the Pork-barrel-paid ousting of late Chief Justice Renato Corona due his righteous intentions of distributing Hacienda Luisita and the inconsistencies of his Statement of Assets, Liabilities and Net Worth (SALN), CONSTITUTIONAL! The ousting of the now-former Chief Justice Maria Lourdes Sereno who also had inconsistencies with her SALN on top of her devious track record, loose spending for her luxury and disrespect for her Associate Justices, Supreme Court and the Constitution itself, UNCONSTITUTIONAL! And so is their questioning of the right of the “final arbiter of the Constitution as laid down in the Constitution”! 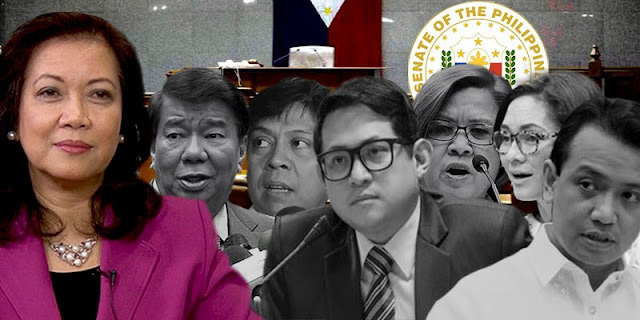 It is funny that at one point after the 2016 Elections, did the Liberals plan on overthrowing Duterte having Vice President Leni Robredo, whose legitimacy is now being questioned by Bongbong Marcos and looked into by the Presidential Electoral Tribunal, to take his place. Fraud revolving around the elections is everything but democratic. And these Liberals create chaos, shouting that democracy is in danger, acting all hero and defending “democracy” and the Constitution when in reality, nothing is threatened because due to the fact that the elections, ever since the start of electoral fraud, has killed “democracy”. It’s not that am pointing fingers, but with the initial results of the manual recount that’s headed by the PET, it seems that Robredo or her party might have a hand in this everlasting dead democracy. And sadly a facade of democracy, the dead kind, is all the Philippines has due to the stagnation that the privileged and powerful oligarchs of the country want. Alejandrino ended his post by hating such disturbances in his love life. Such disturbances that can be prevented with the peaceful and prosperous revolutionary government.